These give you chocolate, they give you sweet, salty, crunchy, moist. Perfection. Preheat oven to 325 degrees F. Spray 8x8-inch pan with nonstick cooking spray. Prepare brownie mix as directed and pour into prepared pan. 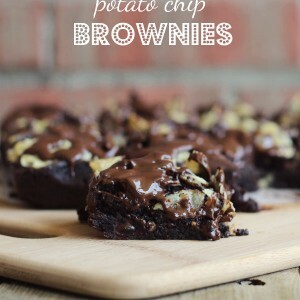 Top with crushed potato chips and bake for 40-45 minutes or until brownies are set in the middle. While brownies are cooling, melt chocolate chips and oil slowly using the microwave (30 second intervals, stirring in between intervals). When smooth, pour over brownies. Cool completely prior to serving.